Have you ever read a novel and heard a voice in your head? A voice that wasn’t your own. That was distinctive and unique? It’s essentually how you sound through your writing. Tone of voice is the way you say something. It is your personality, your language, the rhythm and pace of your sentences. It’s what differentiates you from other companies and your competitors. In other words, if your logo disappeared, your images, your colours – everything, would people still recognise who you were from your writing? Or does your writing sound like everyone else’s? Does your writing blur into insignificance? We’re business owners, not novelists, so why on earth should we care about tone of voice? Tone of voice helps your target audience connect with you, it helps build trust and relationships. It helps differentiate you from your competitors. Think about it. When reading anything, don’t you want to connect with the writer? Don’t you like it when you feel they’re talking directly to you? It also helps attract your ideal clients. You speak in a way that attracts the people you want and repels the ones you don’t. You can’t appeal to everyone, otherwise, you’ll just end up being boring and forgettable, and no one wants that. For personal brands, tone of voice is vital. You are the business and people need to get a sense of who you are and what you stand for. Where should you use tone of voice? It’s not just in web copy you need to think about your tone of voice. It’s everywhere. Your social media, content marketing, even in your emails. Every piece of writing should have your stamp. How do you create a brand voice? Okay, so we’ve established that tone of voice is important. But the question is, how do you come up with your voice? Below, I’ve gone through the ways you can nail your tone of voice, with examples throughout. Let’s start right at the beginning. 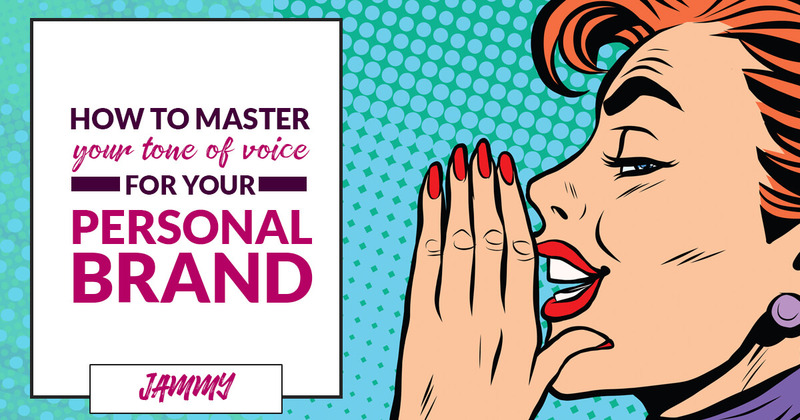 You can’t establish your tone of voice without first establishing your brand personality. Your brand personality is a set of characteristics that make up your brand. For personal brands, this is much easier to establish than other businesses. Our brand personality tends to be closely linked to our own personalities. If you’ve never thought about brand personality before, you’re probably doing a lot of it subconsciously. We all have personalities, don’t we? And you’ll act a certain way with your clients or customers and speak to people a certain way in email or on social media. The key is to do this consistently, with purpose and across all your channels and platforms. The topic of brand personality could take up its own book! However, for the purpose of this blog post, I’m going to quickly outline how you can establish your brand personality. Try to avoid words like friendly or professional. These are ‘meh’ words, that don’t add anything to your brand. The minimum we should expect from someone is to be professional and friendly! If I could give one tip about establishing your brand personality, it’s don’t be someone you’re not! We see this quite often in our industry, where suit-wearing guys aged 50+ try to be cool. Don’t be the embarrassing dad in business. If you’re a serious, suit-wearing, straight-talking kind of guy, then that’s fine. Don’t try to be fun or quirky or cool when you’re not. Another thing to consider when establishing your brand personality is your audience. You want to make sure there isn’t a disconnect between who you are and who you want to attract. We once spoke to someone who wanted a pink and ‘girly’ website that reflected her fun and sassy personality. Her target audience was uber professional, corporate types. Now sometimes this is fine, it’s not as if uber professional corporate types aren’t people with their own personalities, however, this lady quickly realised that it wasn’t going to work. There was a disconnect between her brand personality and her audience. So the key question is, once you’ve established your brand personality, how do you reflect this in your writing. How can you create your tone of voice? 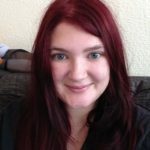 Below, I’ve gone through the ways you can use your writing to reflect your personality and connect with your reader. I get it. When it comes to writing our backs go up. We’re sent back to high school where everything had to be prim and proper. No starting a sentence with And or But. And no writing how you speak. It’s no wonder that our writing sounds stuffy and formal. The problem it’s difficult to connect with our reader this way. I see this all the time. People have great connections with their potential clients over the phone or face-to-face, but when it comes to their writing they automatically stiffen up. Does the date January 31st cause sleepless nights and sweaty palms? Don’t worry. Just drop in anytime this week to discuss how we can help you. Decent cuppa’ guaranteed. Of course, this is all dependant on your brand personality. If you are formal, then fine. Sometimes there’s a place for formal language, but often, and particularly with personal brands, an informal ‘chatty’ route works much better. When you sit down to write, just remind yourself that you’re talking to another human. Think about how you’d speak to your clients or potential clients. This should be enough to avoid that formal, stuffy language that’s so off-putting for your reader! Using humour is a wonderful way of expressing your personality and building trust with your audience. There are lots of different types of humour you can use, from sarcastic to self-deprecating to silly. What works for you will all depend on your brand personality. But it’s important to remember that when using humour, it should be something that comes to you naturally. Do you use that humour with your clients or customers? And do they appreciate it? I love this guy. It’s a testament to how much we like him as he is a fellow web designer! 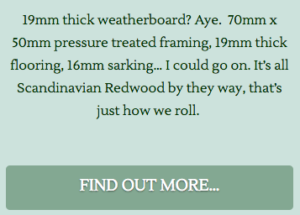 His website copy cracks me up. Will he appeal to large corporate businesses? Possibly not, but that’s most likely not his target audience. The way he uses humour attracts a particular type of client. It’s also likely to repel a lot of people too. But that’s okay. Most importantly, his humour helps you connect with him. It builds trust and loyalty. It makes him likeable and familiar. Swearing is a controversial one. Some people are adamantly against it. Some people love it. But if swearing is a natural part of your speech, if you swear with clients or customers and your target audience responds well to it, then why shouldn’t you use it in your copy? 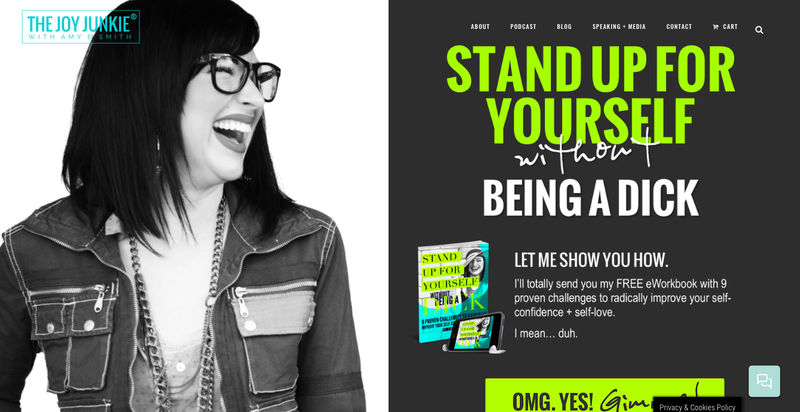 I love how Amy from Joy Junkie uses swearing in her copy. You immediately get of who she is from this – no-nonsense, fun and relatable. Like the example above, some people will hate it, others will love it, but either way, you’ll remember her. She doesn’t just drop in a random swear word here and there, you can tell this is a natural part of her speech. 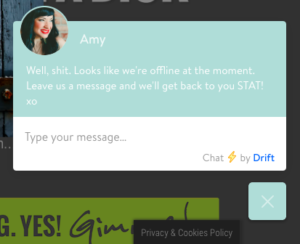 She even swears in her drift message, which makes me love her even more! Regional dialect works extremely well if you have a local audience who use the same words and phrases as you. We’ve all heard the phrase, familiarity helps build trust. This is why using regional dialect in our copy works so well for a local audience. It’s familiar to them and immediately that builds a connection to you. 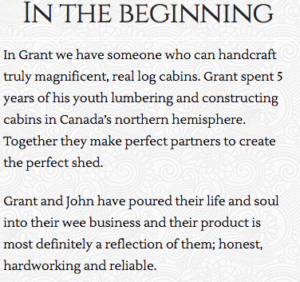 Dotted throughout the Gillis and Mackay website are regional words and phrases and it really gives you a sense of place when you read their copy. They build sheds for people throughout Scotland so this kind of phraseology works well for them in connecting with their readers. This is a neat idea we’ve stolen from the guys at Atomic – Andrew and Pete. Creating your own unique set of phrases and words makes you memorable, and it’s amazing how often you’ll hear people repeat them! These phrases will stay in your reader’s ears and they will immediately think of you when they hear them. We started using the phrase ‘Website Shame’ to reflect how people often feel about their own websites. People have repeated this to us and on social media. We’ve even had emails with people asking for us to help them because they’re experiencing ‘website shame’. The key for this to work is to use something your audience can relate to. Don’t just make something up completely. 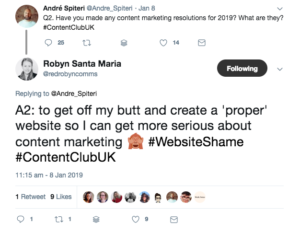 We used the phrase ‘website shame’ because people repeatedly told us they hated their websites and felt they couldn’t promote their business because of it. Owner at Jammy Digital, Digital Marketing Specialist and Writer of Young-Adult Fiction.